This week UK taxpayers are starting to receive letters which detail where their money goes. It is a George Osborne initiative designed, supposedly, to increase transparency about how taxes are spent. Here is what taxpayers will see. It shows that a quarter of state spending (including debt interest) goes on welfare. And everyone knows what welfare involves - welfare payments to the unemployed, the poor and disabled etc. Except that this is not how welfare is defined here. As the IFS point out, welfare in this figure includes pension payments for those employed by the state, like nurses and teachers. Why the welfare total should include these pension payments, while the state pension itself is separated out, is inexplicable. The IFS also point out that this welfare total includes spending on social care, which is not a cash transfer, and which would be more logically included under health. The IFS also show how it would be quite easy to break this welfare total down into more meaningful parts. So the way the chart aggregates welfare spending appears not only wrong, but also strange if the idea is to inform the public. But of course that is not the aim. This presentation is part of the Chancellor’s election campaign to convince voters that there is plenty of scope to cut public spending further by reducing this huge welfare bill. The idea is that many of those receiving this information will assume welfare involves all those state handouts to scroungers that their newspapers are always providing examples of. The background to all this is straightforward. When people are asked whether they want higher, the same or lower taxes and government spending, about 35% say they want higher taxes and spending, while about 7% want lower taxes and spending. For a Conservative party committed to reducing the size of the state, this is a serious problem. The solution is two-fold. First suggest, mainly through a constant stream of newspaper articles but occasionally backed up by TV and the Chancellor himself, that some part of public spending is wasted on transfers to the undeserving poor. Second, label that ‘welfare’ and exaggerate its size as much as possible, using in this case public funds to do so. This is not about transparency, and it is not even about spin. It is about giving a distorted view of reality to produce a political outcome that only a small minority of people appear to actually want. Postscript (6/11/14) A number of people have written about how misleading the government's presentation is, although most do not put the background in quite as stark a way as I do. To see why this matters, here is a nice poll from YouGov, which shows how opinions are influenced by better information. Which, of course, George Osborne knows full well. The welfare figure also includes Tax Credits paid out to working families. With Labour's success with their "falling standard of living" argument, it is hardly surprising Osborne does not want to show graphically just how many people there are on low incomes. This also applies to other Working benefits such as Housing Allowances which, if identified, would show how much we need more affordable housing. The ironic thing is, if the real figures were known, opinions about pay levels or the need for more affordable housing might change. There's clearly nobody in the cabinet who understands statistics though if they think that chart won't make people query the evidence. The true culprit here is the Labour Party. The leaning to the right, the constant apologising for things they were not at fault, the dismal leadership. The only reason the conservatives get away with this is because there is no opposition party. The BBC is another reason. In the past they've failed to fulfill the “educate, inform” part of their “educate, inform, entertain” remit on 'controversial' issues such as AGW, MMR and GM. But I don't think they let the public down as badly over those as they have over certain 'non-controversial' economic and social issues. The EU budget figure might lead people to think that there is much ado about nothing in the costs of Europe. Although for many it is not about the money. But the debt figure will not go down well at all. 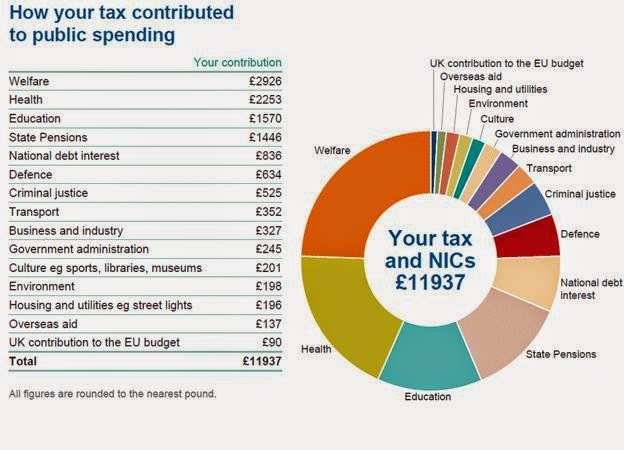 It is a pity the IFS figure showing the split of the welfare costs were not put in the post itself. They do highlight that the welfare element is misleading. I wouldn't chuck the baby out with the bath water, the idea that the Govt should tell the citizens where their direct taxes are spent is a good one. I agree with your first sentence - but I find it hard to imagine how anyone could disagree, which is why it seems hardly worth saying. But your third is wrong. I am not presuming, but trying to explain why apparently odd decisions can make sense. Do you really think I'm wrong? If you have a better story, let us know. A pox on both your houses really does not apply here, if you don't think the motive for this was political you're not paying attention. Take a look at how the announcement of this letter was initially covered Daily Mail ("How the biggest chunk of your hard-earned tax goes on welfare"). You can also look at the announcements the government has made about refinancing the war loan ("Government to begin paying off WW1 debt, announces George Osborne") or at the way Osborne kept on ramping up the rhetoric of austerity even has he was actually easing off on austerity. There's a clear message the government wants to convey and this letter is yet another part of it. If the letter goes out in this form then George Osborne will have used government resources for the purpose of political propaganda. And if the Labour party has any sense they will call for him to resign over it. My view is simpler, for whatever reason, the Govt wants the public to have greater visibility of tax, spending and borrowing. The creation of the OBR is evidence of this and so is this statement. Neil, there's going to be a general election next year. Whatever the merits of this kind of transparency, the choice to do this now, in this way is pure shameful politicking. Unfortunately, wilful deceit, deception, outright falsehoods and misinforming the public (aided and abetted by some of the biggest news publications in the land) has been the hallmark of this government, so it is no suprise and far from inaccurate for SWL to interpret Osborne's latest stunt as pure political misinformation. The Chancellor has form in this regard. Another flaw (I suspect) is "national debt interest". To give a realistic view of that item, it should be presented in inflation adjusted terms. E.g. where the rate of inflation is equal to the rate of interest on the debt, then no real interest is paid on the debt, in which case that item ought to be "zero". The government took teachers into the central state and away from councils as part of Kenneth Baker's - another St Paul's boy I think like Osborne - attempt to voucherise education. I see the government has brought maths teachers across from China to tell state school teachers how to teach maths - perhaps they will have a look into this, or maybe lecture the UK on human rights or on religion? Isn’t there a body called the UK Statistics Authority, Chaired by Sir Andrew Dilnot CBE, whose job it is to ensure that public statistics are presented in a proper format and not subject to political bias. If this is the case why have they not commented on the presentation of these statistics? I agree that this is a good idea, but it's only worthwhile if the aggregation of data into accounts is not done with a political purpose. As professor Wren-Lewis pointed out, what we have here probably is a politically motivated choice, although we can't know that for sure. Someone who is not acquainted with social sciences or data could very well make that sort of mistake, just as would an idiot with credentials. We can doubt for good reasons a government would hire anything short of a competent staff for that sort of job, although it's not impossible. So, out of sheer luck, an incompetent staff could somehow manage to come up with only one crucial mistake that happens to bias the chart in a very convenient manner for the party in power. As a teenager who planned to "randomly" bump into their crush in the halls between classes, we could say "what a coincidence!" Another alternative scenario would depict the Conservative party and government staff as being thoroughly blind to their own behavior. They don't know and don't plan to act with a bias and sincerely believe they're acting for the greater good of the commoners. They just did it without noticing it. This story sounds much like the behavior of a 5 years old. He wants to do well very bad, so he makes an effort to fetch you a cold glass of water in the kitchen even before you ask for it. On his way back, all clumsy that he is, he drops the glass on the floor and breaks it. Re: BBC's role in educating and informing. In the BBC website article about this trashy little piece of standard Osborne mendacity, the reporter said that around 30million people in the UK pay tax. Now, as it happened, my 5 and 6 year old kids had just spent some of their spending money on toys before I read that. I guess I should go and ask for a refund on the VAT that the BBC appears to ignore as "tax" when calculating the number of payers. Whilst I generally agree with your article, I think you are underestimating Osborne's mendacity here. He certainly IS a small state person, but he also knows that he's not going to be able to make the cuts that he is shouting as necessary in the next Parliament. We're not dealing with Osborne as the fabled master strategist. We're dealing with him in his most natural guise - the weasly tactician. He will not be able to achieve the cuts in Welfare (sic) that he says are necessary, but he is going to push hard the line that they ARE necessary, and that Labour is soft on scroungers if they don't agree. The tactical aim there is to win in May. If he does, and then fails to make the savings (as he will) he will not be held to account because we have an utterly inept/corrupt media. Think about it. Your in his shoes. You know that the term Defecit Denier won you (almost) the last Election. You know that you pushed the line that the deficit had to come down to protect our AAA rating. You were on record as agreeing with A&A and R&R on the over riding need for Austerity uber Alles. You were one if the ones invoking the Confidence Fairy as our route out of Depression. And then the deficit came down much more slowly than you had said was needed. We lost our AAA. The intellectual crutches of your argument were smashed. The Confidence Fairy resolutely stayed at home. And the media response? You have won the economic argument and Ed Balls is a blinky, stammering fool. Wouldn't you play the same tactics again? Indeed, the lack of tough questioning directed towards Osborne, compared with the endless examination of Labour's "economic credibility" is staggering. Simon, thanks for the expose' of the usual deviousness, cynicism and mendacity of Osborne - as referred to by your other respondents here. This latest gimmick is just a ploy to fool the voters - but it's so blatant and so crude that for anyone with the slightest bit of nous to call it as such almost falls into the category of stating the bleeding obvious. Shame we can't get this into the Guardian or Independent in their comment columns.